Architectural evidence indicates that there was a church at Upper Slaughter by the 12th, perhaps by the 11th century. From the 14th century the rectory was in the gift of the lords of the manor. The lord of the manor in 1831 sold the advowson to the then rector, who in 1852 bought most of the manorial estate. In 1961, after the amalgamation with Lower Slaughter in 1954, the great-grandson of that rector was sole patron of the united benefice. 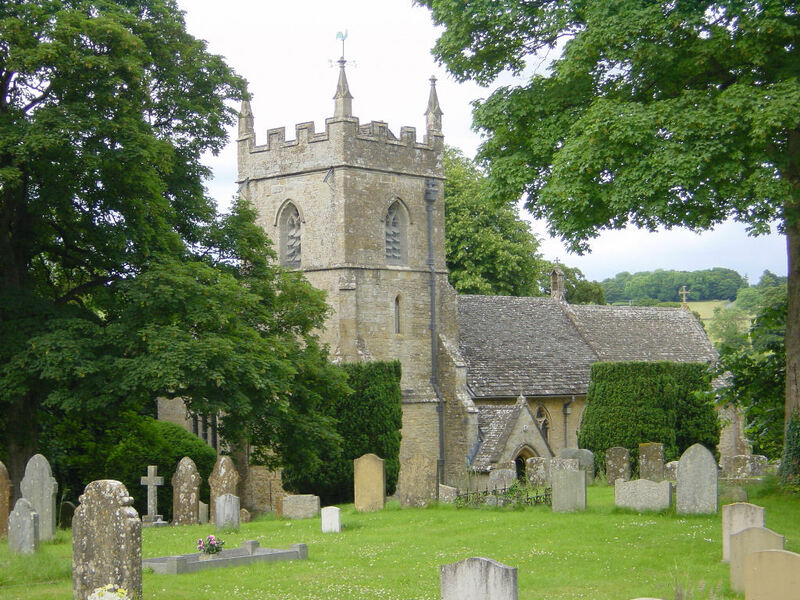 The two parishes remained distinct, but Eyford parish, which was without a church from the 16th century and therefore often described as extra-parochial, was effectively part of Upper Slaughter for ecclesiastical purposes long before the statutory abolition of extra-parochial places in the mid-19th century and the union of Eyford and Upper Slaughter civil parishes in 1935. St Peter's church, Upper Slaughter. The rectory was a comparatively poor one, worth £6 13s. 4d. in 1291, under £15 clear in 1535, and c. £80 in 1650. The rector had some glebe in the common fields c. 1300, but in 1535 it was returned as only 16 acres of arable and meadow. By 1680, however, there were two yardlands of glebe, comprising 51 acres of arable and 18 acres of meadow and leys. In 1731 the glebe was commuted for 45 acres and the tithes for 180 acres. The rectory was valued at c. £100 a year in the mid-18th century, and c. £200 in the mid-19th. The first known rector, in 1251, appears to have been an Italian, and in the early 14th century three successive rectors were licensed to be absent from the benefice. There were several exchanges of the benefice by later incumbents, one of whom was a noted 'chopchurch'. In the later 15th century, however, one rector, apparently resident, remained for 45 years or more. One of the 16th-century rectors, a doctor of civil law, provided curates to serve the cure; he was non-resident and described on one occasion as contumacious. His successor, who was deprived of the living in 1554 and restored in 1559, was in trouble in 1569 because his servant was pregnant and his house and the chancel were out of repair. The next rector, though resident, was a pluralist and was neither a graduate nor a preacher. From 1634 until 1699 the rectory was held successively by a father and his son: the father, described as a preaching minister in 1650, subscribed in 1662; the son, a pluralist, provided a curate to serve Upper Slaughter. From 1701 all the rectors appear to have been resident, and the period 1764– 1913 was covered by only four rectors, who were also lords of the manor from 1852. Francis Edward Witts (d. 1854), nephew of his predecessor and father and grandfather of the next two rectors, was actively engaged in the affairs of the county, and, though a pluralist, resided at Upper Slaughter; during his time the number of Communion services was increased from four a year.